People, I need your help before our entire family falls victim to alien invaders that are disguised as onion grass. The grass first appeared last year in the bed of plants on our front lawn. I'd never seen it before and I am usually clueless about detecting what's weed and what's plant, but I knew this stuff had to go. When I pulled up some stalks, I realized they smelled strangely like onion. Then I pulled up the roots and holy cow, there were little onion bulbs down there. I thought they were creepy, like some alien plant had invaded our lawn. I immediately posted on our town's community bulletin board. "How do I get rid of onion grass?" I asked—and got a whole bunch of responses about how lovely it tastes in salads. I spent a few hours last summer pulling the stuff out at the roots. Sabrina pitched in for about two minutes before realizing how annoying the task is. 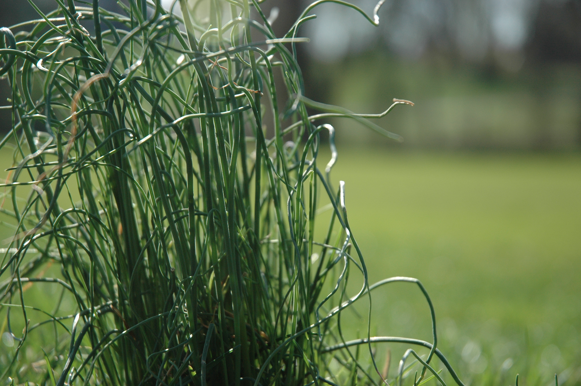 This year, the onion grass has returned in full force. Now it's not just in the plant bed—it's on the front and back lawns, too. Yes, the aliens have returned and this time, they may just morph into evil extraterrestrials who take over our lives and minds and this blog, which will be renamed Love That Onion Grass. If that should happen, please immediately alert the authorities! This is one of a series of weird nature happenings at our home, including but not limited to the dead birds and the squirrel who liked Justin Bieber. Meanwhile, I do like coming home to a nice-looking front lawn that does not have an alien presence, so I have spent several weekend afternoons cutting off the onion grass stalk by agonizing stalk and spritzing weed killer, which is what the guy at the garden store said to do. It's been a losing battle: More onion grass keeps coming up. Dave could care less about it, which he will surely regret when the plants attack us in the middle of the night. Also: I do not want to spend any more of my precious free time dealing with it, time that could be spent on the kids and/or watching HGTV. This is where you come in. Would you swing by and help me pull it? He he, I would never expect that of you. So could you just send your husbands? He he. Seriously, folks (and onion grass is no laughing matter, we're talking about a national security issue! ): I have gotten such amazing advice here over the years and was wondering what sort of suggestions you might have about dealing with it, and preventing it from returning. Nobody suggest onion tart or onion dip or I'm coming to your house and planting some onion grass. Having a rough start to the morning. Thanks for the morning laugh!!! I want a pet pig now just so I can name it Rabbi Bacon. It's a cool season weed, so it'll go dormant once the weather heats up. Personally, I think they're cute and appetizing. But is you can't live with them, better to pull and mulch in the garden, and get the lawn on a good organic regimen than go the chemical route. For six years we've had onion grass and every time we mow it reeks of onions!!! I think our property was an onion field before we bought it. Isn't it amazing how things like this can consume you? For me last year, it was the (at first unknown) varmints eating my flowers one by one. I began obsessively taking pictures of my flowers every day, just in case they weren't there the next. I counted them every time I got out of my car... and when I finally identified the problem, I showed NO mercy. Teach Max to pull them and call it OT. I'm only half kidding. I loved pulling this stuff up as a kid bc I loved the way it smelled. Looking back, I think I was duped by my mom. Follow in her footsteps. Found this and sounds easy...almost too easy. Plus it only mentions onion grass that grows between patio stones. "Pour undiluted white vinegar on wild onions that are growing between patio stones. Vinegar burns the leaves and keeps the sand or soil between the stones too acidic to support further growth." So basically, hook up your lawn sprinkler to a great big jug of white vinegar, grab a glass of wine, sit back and feel victorious that you showed that onion grass who's boss. I hate onions. Uproot them. Hi. I work for a landscaper and I asked our fertilizer technician about the onion grass. He uses weed killer, aka Round up! Belated thanks to everyone for the great suggestions, including teaching Max to pull the onion grass an OT activity (genius)! The onion grass issue has taken a temporary backseat to the cicadas all over the lawn!! !